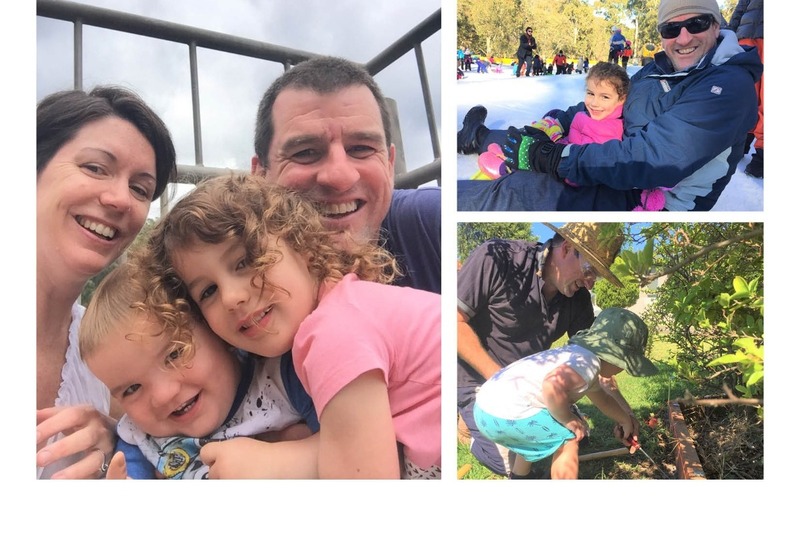 Just a month ago Mick O’Dowd was a fit and healthy 45 year old Sydneysider married to Katharine and enjoying life with their children Amelia, aged 6, and Thomas, aged 3. A mechanical engineer by profession, Mick loved to work on the car he is building in his garage, when he wasn’t hanging out with the kids, cooking amazing meals or camping with the family. Life was good in its everyday normality. No one could ever have anticipated what was about to happen to dramatically change the lives of this young family. On Christmas Day, Mick was cooking Christmas lunch and, like so many dads, assembling Amelia and Thomas’ new toys. Two days later Mick was on life support with his organs shutting down. Now Mick has undergone amputations to all four of his limbs and needs your help. Three days before Christmas, Mick complained of a sore gluteal muscle and saw a physio. He felt a bit better and continued with Christmas preparations with his family. On Christmas night, the pain in Mick’s glute was so severe that he went his local hospital’s emergency department. The diagnosis was Sciatica and he was sent him home with anti-inflammatories. By Boxing Day Mick’s pain was significantly worse necessitating a return to the hospital where his low blood pressure and high temperature were noted. From this point on Mick quickly deteriorated. He was transferred by ambulance to the Intensive Care Unit at another Sydney hospital. 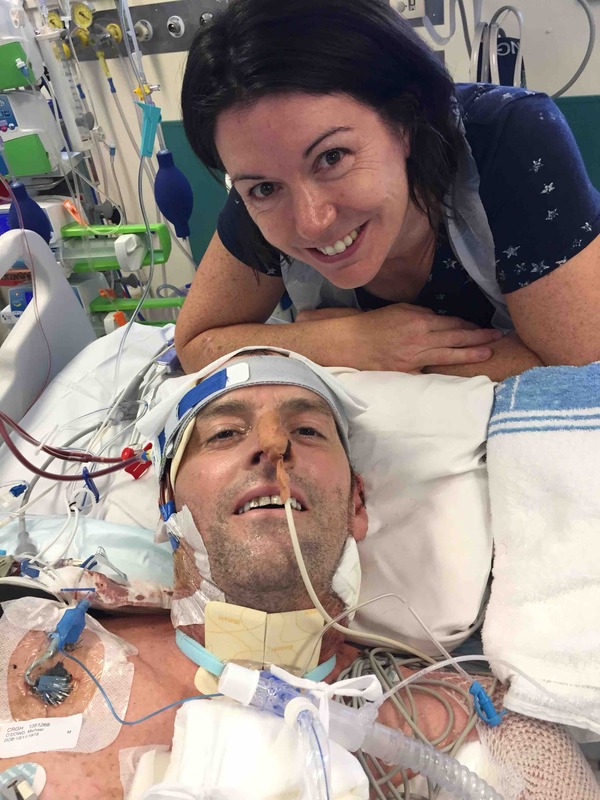 Mick was placed on life support as his organs were shutting down. Mick had a Strep A infection in his leg causing necrotizing myositis, otherwise known as flesh eating bacteria. It is a common bacteria that started with a mild sore throat, the doctors don’t know how or why it got into his bloodstream and attacked his muscles. That night he underwent the first of many surgical procedures to remove infected and dead muscle from his buttock and thigh, to save his life. Mick’s organs were hit by the toxic shock from the bacteria, causing limited functionality. The intense medication he was on to stabilise his blood pressure resulted in limited circulation, causing further damage to his limbs and extremities. The toxic shock also caused burn-like injuries to over 70% of Mick’s skin. After his first surgery, the medical team gave Mick a very low chance of surviving the following 3 hours. Then they said Mick would be lucky to make it made to that evening. He made it. The next 24 hours were critical but again Mick beat the odds. Every challenge Mick faced, in a coma and on life support, he met surpassing all expectations. 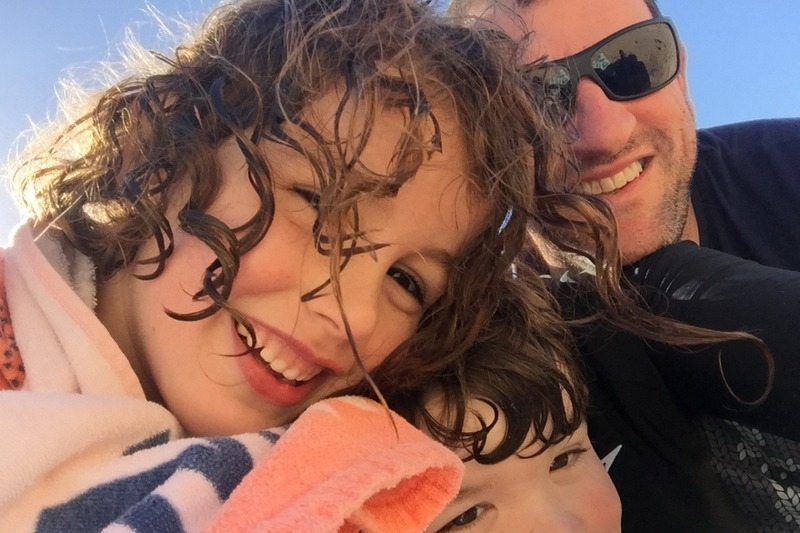 Mick’s love for his family and determination to live and see his children grow were behind his extraordinary strength and willpower, to beat these otherwise insurmountable odds. However complications arose. Three days later, the doctors identified Compartment Syndrome from the toxins in his lower limbs resulting in an emergency 8 hour surgery on Saturday night, removing more dead muscle from his lower arms and legs. Amazingly Mick pulled through this new challenge with his critical results slowly improving. New Year’s Day started with yet another surgery to clean Mick’s wounds. It was at this stage that Mick slowly began to regain consciousness; this was a huge relief and step forward. His organs slowly started to regain their functionality. A respiratory tube prevented Mick from talking but he was able to communicate by blinking and nodding/shaking his head. Throughout the entire ordeal Katharine never left Mick’s side. The whole family has been on hand to provide support and look after Amelia and Thomas. Two weeks after Christmas, Mick was still in ICU, his condition very fragile. He had multiple complications including pneumonia, intestinal ischemia and secondary infections. He had further surgery to clean out areas of infection and muscle loss. Mick’s strength and determination to survive continued to amaze the medical team looking after him. On Friday 11th January, Mick had exploratory surgery which revealed that to keep him alive, both his arms and legs would need to be amputated at different points. His hands and feet had become gangrenous as a result of the infection, toxins, poor circulation and low blood pressure. Fortunately, with treatment, his blood pressure and circulation have recovered but his limb extremities remained non-viable. The extensive amputation surgery was performed on Wednesday 16th January 2019. Mick remained stable through the very long operation. His arms were amputated below the elbows and both legs below the knees. Subsequent surgery to remove further dead tissue has shortened Mick’s right leg to above the knee. Mick still faces complex muscle transfer surgery to his right hip/gluteal region, where the infection started. With the dead tissue all removed Mick now has a better chance of recovery. The medical staff now hope that he will be off the ventilator soon, and able to communicate better. As Mick stabilises, he and the family look forward to his transfer out of the ICU. It is encouraging that the position of Mick’s arm amputations mean that he should be able to manage well on prosthetics. The rehab doctors have also explained that hand prosthetics are now vastly improved. Using myoelectric prosthetics Mick should have a good range of movement, control and ability. This has been very reassuring to Mick who, when he was able to talk via a speaking valve on the ventilator, said he is thinking a lot about work. Getting back to work, being active and involved in his family is a really important part of who Mick is, and will be central to his recovery and wellbeing. Mick is one of the most determined people you will meet, he has never before given up on anything and it is clear that he doesn’t plan to start now! His many doctors and nurses continue to be amazed by his strength, courage and will to recover. His inspirational strength and determination to live have been instrumental in him overcoming extraordinary obstacles, and give him the best chance of success in dealing with the many new challenges his life will involve. Life as they knew it will never be the same again for Mick, Katharine, Amelia and Thomas. Financial support from friends and the community around them, however, will make a significant difference in ensuring the new chapter of their lives is the best it could possibly be. Thanks to the amazing skill and dedication of the medical staff and Mick’s family, not to mention his own strength and will to live, Mick now has a future to look forward to. Please help us to make that future a bit easier by considering a donation to Mick and his family. All funds raised will be designated to the purchase of Mick’s prosthetics. The cost of myoelectric hand prosthetics is in the order of $150,000 per prosthetic. This type of prosthetic will enable Mick to return to meaningful work and continue to be the involved father he has always been to Amelia and Thomas. Amelia and Thomas are young enough to adjust to their new life and, with time, their memory of what happened to their dad may fade. Your gift will make a significant difference to the family’s adjustment to their new life and the childhood of two precious children. Good news! After 3 months in Intensive Care, Mick has just been transferred out to the burns ward. This is a huge step forward for Mick, who has been healing well and getting stronger day by day. Huge thanks to the doctors and nurses at Concord Hospital ICU who have helped Mick get to this point with their amazing skill and kind care. A couple of weeks ago Mick had his first skin graft surgery. It went well, and more grafting will follow once he has healed from the first round. Mick is still in good spirits, which is great to see. He still has a feeding tube and tracheostomy, and he is REALLY looking forward to having an icy cold drink and being able to talk again (he is still limited to a few hours a day) as he gets stronger and stronger. Thanks again so much for your care and support of Mick and his family on his long, but finally steady journey to recovery. Thank you all so much for your support for Mick, it is such a boost for him and Katharine to know there is so much love and support out there as the journey continues. Mick has had a rough few weeks but recently turned a corner and is now off dialysis with a few weeks break from surgery to begin to heal. Mick has had muscle transfer surgery to cover his hip joint. He has recently reached a milestone where his legs and hip were covered with a synthetic skin, to protect them and allow them to begin healing in preparation for skin grafts. When he’s awake Mick always manages a smile - this is Mick and Katharine on Valentines Day ❤️. Please continue to share Mick’s story and raise support for the long journey he has ahead. Thank you!